bl.uk > Online Gallery Home	> Online exhibitions	> Asia, Pacific and Africa Collections	> Chauburji, Lahore. Photograph of the Chauburji Gateway at Lahore, Pakistan, taken by an unknown photographer in the 1880s, part of the Bellew Collection of Architectural Views. Lahore, the capital of Punjab province, is considered the cultural centre of Pakistan. Islam came here after the advent of Mahmud of Ghazni in 1021 AD, and it was subsequently ruled by a succession of dynasties of the Delhi Sultanate, followed by the Mughals, the Sikhs and the British. It reached its apogee under the Mughals, known as the Garden City and with enough architecture to rank it with other great Mughal centres like Delhi, Agra and Fatehpur Sikri. 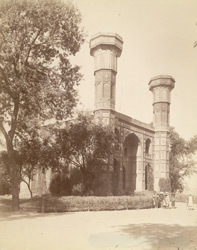 The Gateway of the Four Minarets or Chauburji was once the entrance to one of Lahore's many pleasure gardens. The garden, together with one of the gate's corner minarets (on the north-west) is now lost. An inscription on the gateway records that the garden was established here in 1646, in the reign of Shahjahan, by a lady described as Sahib-e-Zebinda Begum-e-Dauran, or 'the elegant lady of the age'. The lady referred to is probably Jahan Ara Begum, the eldest and favourite daughter of Shahjahan, who was known to have built gardens at Lahore. The gateway is beautifully decorated with rich mosaic-work.